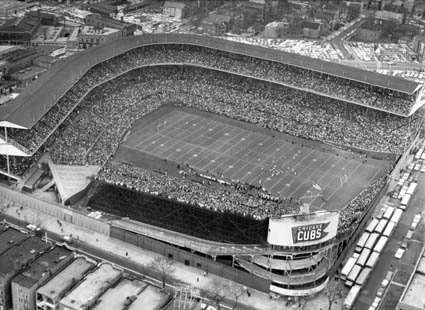 The Chicago Bears of the National Football League played at Wrigley Field from 1921 to 1970 before relocating to Soldier Field. The team had transferred from Decatur, and retained the name "Staleys" for the 1921 season. They renamed themselves the "Bears" in order to identify with the baseball team, a common practice in the NFL in those days. Wrigley Field once held the record for the most NFL games played in a single stadium with 365 regular season NFL games, but this record was surpassed in September 2003 by Giants Stadium in New Jersey, thanks to its dual-occupancy by the New York Giants and New York Jets.The game played between the Jets and Miami Dolphins on September 14, 2003 was the 366th regular season NFL game at Giants Stadium breaking Wrigley's regular season record. The 50 seasons the Bears spent at Wrigley Field had been an NFL record until 2006 when Lambeau Field duplicated this feat by hosting the Packers for the 50th season, and broke it in 2007. Initially the Bears worked with the stands that were there. Eventually they acquired a large, portable bleacher section that spanned the right and center field areas and covered most of the existing bleacher seating and part of the right field corner seating. This "East Stand" raised Wrigley's football capacity to about 46,000, or a net gain of perhaps 9,000 seats over normal capacity. After the Bears left, this structure would live on for several years as the "North Stand" at Soldier Field, until it was replaced by permanent seating. The football field ran north-to-south, i.e. from left field to the foul side of first base. The remodeling of the bleachers made for a very tight fit for the gridiron. In fact, the corner of the south end zone was literally in the visiting baseball team's dugout, which was filled with pads for safety, and required a special ground rule that sliced off that corner of the end zone. One corner of the north end line ran just inches short of the left field wall. There is a legend that Bronko Nagurski, the great Bears fullback, steamrolled through the line, head down, and ran all the way through that end zone, smacking his leather-helmeted head on the bricks. He went back to the bench and told Coach "Papa Bear" George Halas, "That last guy gave me quite a lick!" That kind of incident prompted the Bears to hang some padding in front of the wall. The Bears are second only to the Green Bay Packers in total NFL championships, and all but one of those (their only Super Bowl championship) came during their tenure at Wrigley. After a half-century, they found themselves compelled to move, because the NFL wanted every one of its stadiums to seat at least 50,000. 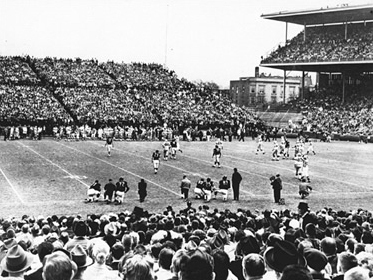 The Bears had one experimental game at Dyche Stadium (now Ryan Field) on the Northwestern University campus, but otherwise continued at Wrigley until their transfer to the lakefront ended their five-decades run on the north side. One remnant of the Bears' time at Wrigley was uncovered during the off-season 2007�2008 rebuilding of the playing field: the foundations for the goal posts.